In February 2016 I wrote What is an Adventure Worth, one of my most well-received and often-discussed articles. I’m thankful for that, because the economics of RPGs is a fascinating subject and an important one. Now that I have self-published Jungle Treks (co-authored with Eric Menge), I want to revisit the subject. As you likely know from my Tomb of Annihilation article series, I’m running the latest D&D campaign adventure. Tomb is a fantastic experience and has become one of my favorite adventures ever. We just wrapped up our twelfth session of play. I found myself looking at the back cover and that sticker price of $49.95. What is this adventure worth? Over 12 plays, the 256-page book has cost me $4.16 per session. There are six players and me as DM. I’m the only one that had to buy it. If we split the cost, it’s $0.59 for each of us per session. Each session is 3.5 hours long. Per hour, we would each pay $0.17 for this adventure. I am probably about a third of the way through the adventure. If we end up with 36 sessions, the cost per session to me is $1.39, the cost per session per person is just $0.20, and the hourly cost per person drops to an astounding $0.06 per hour! Update: In January 2019 we hit our 45th session, and we are still early in the final chapter. The cost to me for the book is $1.11 a session. The hourly cost per person is $0.05! I can compare these costs to other things we can do together, but D&D is a lot more fun than going to the movies or an amusement park. Why is it so much cheaper to play D&D? Here’s another thought. I don’t go overboard on snacks, but we likely spend $2 per person each session on snacks – 10 times as much as we spend on the adventure. Are we snack fans, or D&D fans? I used a Twitter poll to ask a few questions. Now, surely some people aren’t running the campaign. They’re engaging in reading for pleasure as you would a novel, or reading for inspiration to perhaps use the ideas at a later time. But Tomb is clearly an adventure many are running or intending to run. And yet, only 2% find that $49.95 price to be too low. While a majority think the price is okay, a strong 36% find it too high. What drives our perception? I think as fans we can misunderstand the business. We see Tomb of Annihilation heavily promoted. It’s in every gaming store. Even movie and TV stars are playing it! At $50 a book, Surely, Wizards of the Coast must be sitting on a pile of cash! 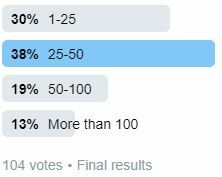 The RPG book business is fairly arcane, so I set up a second Twitter poll. Question 2: On a book such as Tomb of Annihilation, what percentage of the sticker price would you expect Wizards of the Coast to retain? These answers are actually better than I expected. Only 5% thought WotC retains more than 75% of the cover price. That’s unfortunately nowhere close to reality. 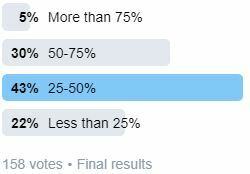 The 30% who felt WotC earns 50-75% of the sticker price are also incorrect. Still, I expected more people to choose this level. The majority thought WotC might earn 25-50%. I doubt it is this high. 22% of the 158 people taking the poll said it was likely less than 25%. This is almost certainly the case for this book, as it is for most print RPG materials. I don’t know whether WotC negotiates any better prices, but I doubt it is substantially different than the standard model. And these days we have a lot of sales through Amazon. I don’t know much about how it works for WotC, but major RPG companies such as Pelgrane Press have said they sell through Amazon as a way to support and promote their product lines, but that at the end of the day they don’t usually make any money at all on Amazon sales. Yikes! Wizards is the RPG company with the largest sales. Move a lot of units and you can still make good money… but so far we’ve just been talking about revenue. Wizards is a fantastic company that provides health care and other excellent services to its staff, along with pay that substantially exceeds that of most of the industry. They have industry-best staff, they use amazing (expensive) art and layout, and they hire the best developers and editors they can find. All of that costs money and some of those costs have to be allocated to every book project. Then, they have to physically print the books as well. And, in the book business, if books don’t sell they get sent back to you or they have to be stored until they slowly sell or are liquidated. All of those costs add up, and we only have something like $12.50 to work with! Think back on all those 2E supplements and boxed sets. Some of those superfluous Complete series of 3E books? Martial Power 2 for 4E? I bet a lot of those lost a lot of money. A lot of great books likely also lost money, including some of our favorites. The 5E books have sold at record levels, but it says something that the latest book, Xanathar’s Guide to Everything, is already being reprinted. That caution comes from knowing the perils of the business. My latest adventure, Jungle Treks, is co-written with Eric Menge. He works on the online and print comic Snow by Night. (In fact, he has a Kickstarter for volume 3. It’s an excellent series. Please consider supporting it!) With his love of art, he wanted to commission some art, instead of using free art the way I did for Adamantine Chef. I thought I would see how perceptions have changed regarding DMs Guild adventures. Most feel $4.99 is a good price. When I released Adamantine Chef I often heard it might be priced too high. Maybe it’s the idea of art/layout, or maybe perceptions have improved somewhat? A good 29% thought the price should be higher. Only a few found $4.99 expensive. That’s great progress! Question 4: A DMs Guild author releases a $5 adventure with a commissioned color cover and several interior b&w art pieces. How many sales do they need to cover art costs? This question was an attempt to gauge how well costs are understood, and 67% recognized that covering art is tough. Cover art such as we have for Jungle Treks runs more than $200 and black & white interior art and cartography can be expensive when it is commissioned. If a Guild author spends $250 on art (Jungle Treks was above that), and the $5 adventure has 50% royalties, the author needs to sell just over 100 copies to break even on the cost of the art. Most Guild authors do their own layout, but paying for layout would further raise costs. Eric spent a week doing the layout for Jungle Treks. My mother is an English teacher with a sharp eye and I’m a passable editor, but we had four others proofread and edit Jungle Treks. Some authors need to or should pay for that as well. In a conversation on Twitter, M.T. Black (one of the Guild’s top independent publishers) mentioned 10 cents a page as a base cost. If a work has 30 pages, then the price point should be roughly $3. 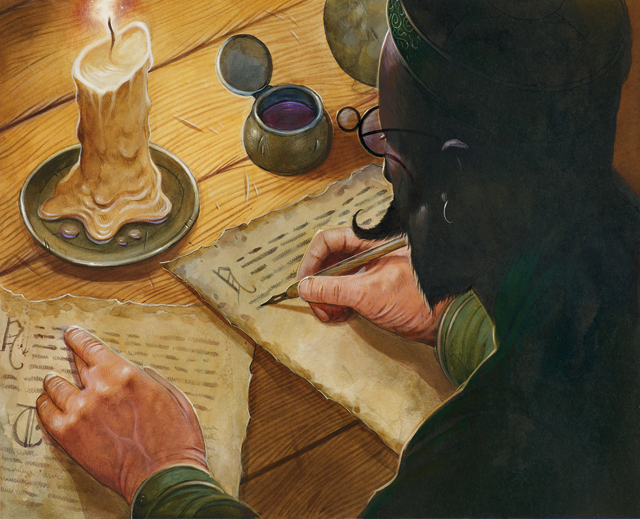 Mike Shea (Sly Flourish, who has used Kickstarter instead of the Guild and employs people for layout, editing, art, and cartography on his awesome work) wrote, “that’s tough. It costs about $1000 min to make a 32 page adventure with cover, art, editing, and design. You’d need 1k sales.” M.T. Black shared that his “costs for Bastion of the Frost Lord were roughly $350. Sales so far are 202 at $2.95. Break even at about 235 sales.” He used free stock art, so he had art costs of $0 and did the layout himself, but he did pay for cartography. Question 5: A DMs Guild author releases a $5 adventure with no art. They want to earn US minimum wage. How many sales might you guess they need to earn minimum wage, on average? Don’t overthink this – gut answer! With this question I wanted to touch on one of the unheralded but important costs for an independent publisher: time. Even top Guild publishers often discount time completely, but it is a precious resource. We don’t go to our day jobs and work for free, but most fans don’t think about the opportunity cost an author faces. US minimum wage is $7.25, though it is a higher $10.50 in California and $11 in Washington, where Wizards of the Coast has its office. Respondents seemed to understand that it takes a lot of sales to cover that time, which is awesome. A $5 product similar to Jungle Treks easily takes 60 hours of work. It would take 174 sales to have $435 in royalties, which would yield $7.25/hour. Jared Espley shared his experience. To create a 35-page adventure, he estimates 120 hours to write/develop, 15 to playtest, 40 to revise = 175 hours total. At $7/hour = $1200 / $2.5 author-payment per copy, around 500 copies to break even at minimum wage, without any art/layout/editing costs! Adding our time and our actual costs together is very rough. If we need at least 174 sales to cover our minimum wage, and we need more than 100 sales to cover art costs, we need 274 sales at a minimum! That’s a lot of sales! Adamantine Chef has been on the Guild for 23 months, and it has 220 sales. While Jungle Treks is doing really well, it is not yet at 200 sales. 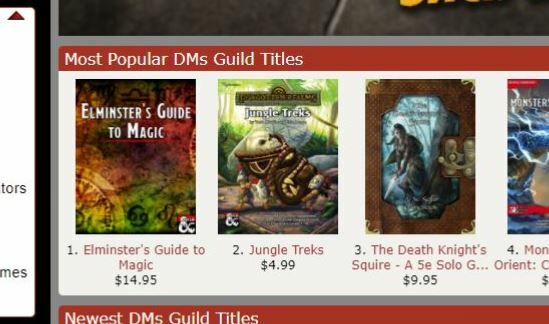 With Jungle Treks I’ve noticed the value of being on the front page of the Guild under the coveted “Most Popular DMs Guild Titles” list. Question 6: A product in the top 10 “Most Popular DMs Guild Titles” gains great visibility on the front page of the DMs Guild. How many sales per day would a product need to be in the top 10? This is a case where respondents overestimated the amount. Most probably think the Guild is seeing far larger traffic (and sales) than it does. 100 sales a day? I would like to meet the product that does that! Even 25 a day is not realistic for most of the top 10. If most top 10 products did that we would have thousands of Gold best-sellers. Instead, over nearly 2 years the Guild has just 141 – and most are Adventurers League adventures, which are not placed in the “Most Popular” category! Jungle Treks made it up to number 2, and for more than two weeks we were in the top ten. A few days ago we dropped off. It surprised me to learn that while it is hard to make it onto the list for most products, it doesn’t take that many sales to get there. Price helps. The driver is total revenue. M.T. Black’s Elminster’s Guide to Magic is both a fantastic product and has a $14.95 price (it is a 178-page product). M.T. shared that he is maintaining his #1 spot with about 80 copies/week. He only spent about $50 on art and did the layout himself. They have just surpassed 1,000 in sales (Platinum), which means $7,475 in royalties split between the four authors. Success, though they worked hard for it! However, the overall volume of most top sellers is not staggering. November is a slow month on the Guild, but even when our sales dropped to 3-6 sales a day we stayed at #9 for a few days until several exciting products knocked us off. The more we understand the industry, the more we can be good fans and stewards of our hobby. That $49.95 book seems really expensive, but it costs us very little per gaming session and only a small portion of that goes to the company that made the product. We can easily spend more on drinks and snacks than on the game we love so much. Independent authors have it tough as well. Making a good Guild product can require high costs for art, layout, and editing, plus all of our time. I used minimum wage in our calculation, but shouldn’t we want a lot higher than minimum wage for the authors that give us such incredible work? If we apply the Tomb logic and divide a $4.99 Guild adventure by the hours of fun it can give us… we are again paying very little for our entertainment. Most Guild authors won’t reach the hundreds of sales needed to cover their costs and time. Yes, there are success stories. However, even the top 10 lists are filled with products that won’t reach the levels needed for an author to break even. I didn’t provide any path forward here. What do you think? What do you make of this? How should our hobby change to account for this? What should Guild authors do? What should fans do? How do we build a healthier hobby? Power Score RPG ran one of the Jungle Treks adventures, Beautiful Plumage, on his livestream! Watch Jungle Treks being played here! He plans to run other encounters in the future! At PAX Unplugged, Wizards of the Coast announced there will be a Betrayal at the House on the Hill “Legacy” edition of the game! Wizards of the Coast also had a special Magic the Gathering / D&D crossover adventure, Ixalan: X Marks the Spot, written by Chris Tulach and Kat Kruger! I hope more such crossover products are released, and hopefully for the Guild as well. Great article but please don’t refer to reading as “lonely fun”. Its a horrible expression. I don’t feel the term has to be negative, but I can see how it can come off that way. I really appreciate the feedback, Rich, and I’ve made the change. Thanks! This is f*cking ridiculous, if true. Why can’t I buy direct from Wizards and cut out the middle man? They get more money, directly and I would pay less per book than at retail ? It’s true of basically all books you read ever. Novels, cookbooks, you name it. There is a value to the distribution model. All those unsold 2E books? They go through a whole distribution system that shields the industry from loss for some time, moving the books around to find buyers. The system has tons of issues, but it isn’t without reasons. Some companies, such as Paizo, do sell direct for higher margins. However, that alienates stores, distributors, and other companies because now the publisher is directly competing with other outlets… and money is very tight for them in this business. All this, plus there is a cost to selling your books direct to consumers that is easier to manage if you are a smaller company like Pelgrane, or running an ecommerce business that supplies products from other companies like Paizo. Imagine WotC having to individually ship out the thousands of Xanathar’s Guides they’ve sold (and it is many thousands, as evidenced by it being in the top 10 of all books on Amazon upon release- and that’s just Amazon) They certainly don’t have the capabilities in house to handle that sort of volume. It would take weeks after release for you to get your “new” product. I’ve been on both sides of this fence and neither, frankly, is very rosy from a business perspective. People have rarely ever wanted to pay what creative endeavors are worth (in terms of time spent) and the internet has cheapened that mindset even further. I enjoy writing (I have several books published) and have recently gotten back into D&D, publishing a few adventures on the DMsGuild, but none of it makes enough money to live on by any stretch of the imagination. Actually, Wizards may not get more money by selling direct. Selling direct requires loads of additional staff and resources. This would include hiring a bunch of additional employees, which is a huge cost for any business. While selling direct -can- work for some companies, it often is easier for larger organizations to hand that off to a third party with the infrastructure and expertise to get the job done correctly. But the fundamental question of “Is $50 too much to pay” is left up to the individual to decide. For me, I’m happy to pay $50 for a quality book or adventure. WotC takes a huge amount of risk in developing D&D products, and the company deserves to profit from it if they produce products people like. Ditto for anyone building great supplements and modules on the Guild. I published one module, written by me, and commissioned some very reasonably priced art, color for cover and B*W for interior. The module sells for $5, out of which I get one third of 70%. That’s $1.05 total going to the person who wrote the entire thing. I think one of the best things we can do for the hobby is to change our perceptions on how much these works should be priced at. This is an informative analysis on the perceived and theoretical values placed upon RPG adventures, thank you. It was a very long read, and I hoped that maybe you could offer to steer us towards what your beliefs are for the future? Or perhaps even what you want to see done more by customers or producers, to help? My 5e & Pathfinder adventure Whispers of the Dark Daeva for the Parsantium setting has taken just over a year to recoup the money I spent on cover and interior art, with sales over 150 copies across both editions. I am lucky enough to be married to a professional editor who also knows how to use InDesign. If I’d had to pay an editor and layout person too I’d still be a long way off making back what I’d spent on the project. I haven’t calculated how many hours I spent writing , revising and playtesting the adventure – it was a lot – although I think Kate did add up all the hours she wasn’t earning while working on the project! I think publishing several works does help, but especially if you then bundle the products together at a slight discount. Many of the top creators have done that. But, that does require that you put in all that time up front to create multiple products, hoping it all works out. I think that there is a lot of parity here between what we are seeing in music and what we are seeing in Pen and Paper RPG content. There are pro’s and con’s, but at the end the day it just is. The introduction of the PDF format made distributing written materials such as D&D game books cheaper, but coupled with the OneBookShelf family of platforms (in which DMs Guild is a part of) this type content has become commoditized, period. In other words, OBS has created a market that makes margins low due to the costs to create a “marketable” piece of work on DMs Guild relatively high. I’ve been fortunate to make a couple thousand dollars with D&D and non D&D titles over the past 6 years, and that’s mostly due to the fact that I’ve had to take the DIY approach that’s discussed in the article above. I’ve put in all this work (and will continue to do so) with the understanding that this is all a passion project and not any way to make an actual living…it’s just not feasible because at the end of the day, this is a niche market that is highly competitive. Wolfgang Bauer gave the best advice when someone asked him about entering the RPG industry: “Marry someone with a job that has health insurance”. I just wanted to put this context out there as I try to answer the questions posed at the end of the post. How should our hobby change to account for this? I’m not sure I understand this question, but I think that there isn’t a lot of room for change for given that (as Mearls pointed out in an article I can’t currently find) D&D competes with everyone’s (and I’m paraphrasing here) “entertainment bandwidth”. Remember, there are plenty of F2P video games, cheap movies on Netflix, etc that can have similar if not cheaper costs per entertainment hour that D&D is running up against. I understand that I’m comparing games vs movies, etc.. but they are all aspects of how someone may choose to spend their free time. D&D is in a good spot and I think any further tinkering would yield bad results. What should Guild authors do? What should fans do? I think Guild authors should understand the “meta game” of being a Guild Author. That means accepting the realities of the time, money, and effort it takes to make a product that’s entering a competitive space like DMs Guild with a reasonable expectation that they may very well never recoup the hard dollar expenses (let alone putting some value on time spent) put into the product. As for fans, my thoughts are they should be prepared to get what they pay for. Generally (and I’m taking out authors that have already built brand equity on the platform and other exceptions) Pay what you want priced items tend to be low effort in some or all aspects of what we understand a successful DMs Guild product to be. How do we build a healthier hobby? Again, it’s hard for me to understand what’s really being asked here, so I’ll go out on a limb (and I understand I’m going to an extreme here) and answer the question as if it was: “Why can’t DM’s Guild Authors charge 3 to 4 more times for their products while enjoying 3 to 4 more times the sales volumes of said products”. I think the simple answer is that D&D products are subject to the same market economy paradigm that apples, airplane rides, and Funko Dolls fall into. DM’s Guild is great because nearly anyone can sell a product on there, but also enables a competitive environment where sellers compete on price and/or quality just to see some kind of sales based on perceived demand. While this creates very few “winners” and an awful lot of “losers” it’s also very fair. It’s hard to think of an alternative that allows for a more equitable opportunity for an author without some kind of compromise on what’s put out there for fans to buy. All in all, I really enjoy this series and hope you keep writing and examining this subject. 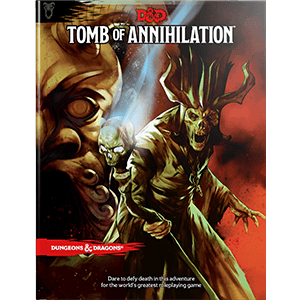 This entry was posted on November 21, 2017 by Alphastream and tagged 5E, Authoring, Tomb of Annihilation.